«©NCSX» NCS has always suspected that Darth Vader had a bit of a paunch and the Jumbo Darth Vader toy from Japanese manufacturer Hot Toys confirms our suspicions. The Dark Lord of the Sith appears to be enjoying extra servings of space chow at the Imperial cafeteria and maybe sneaking an extra dessert after every meal. 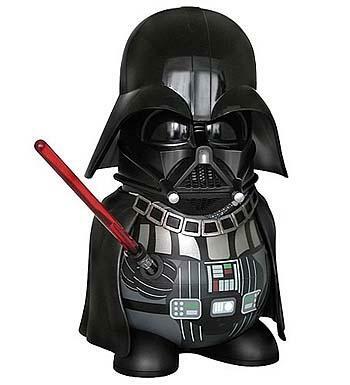 Measuring 25cm or 9.87" tall from helmet to toe, the chubby Darth Vader is shaped like a squat bowling pin and wields a red light saber. Since the design of the toy doesn't allow for arms, the light saber sort of juts out of a receptacle on the right side of Darth's belly. A plastic cape drapes realistically over Darth's back and the electronics on his chest plate are drawn in. Pricing is set at JPY9500 or US$100 from NCS.